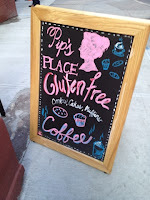 NYC Foodie Girl: Pip Pip Hooray! Gluten free has arrived in a big way, lately. Doesn't it seem all the rage? A new "cakery" (versus "bakery") has opened in Midtown East: Pip's Place. Here, you will find an assortment of savory and sweet. I, for one, have made it a mission to try one of each. They are not terribly expensive like some of the competition bakeries out there, but they are competitively priced. In all fairness, I know it takes a little extra to make things taste good when they are gluten free. There are some locations that do it better than others -and some that just really need to NOT try to do gluten free and vegan at the same time... but that's another blog post. Right now, I've got Pip's on my "recommended" list because the place is clean, has a varied and approachable menu -just the only downside is that you must walk up a few stairs to enter. If you're traveling with a baby or young child in a stroller, -or if you have any issue going up stairs, it's a bit of a pain -so just keep that in mind. 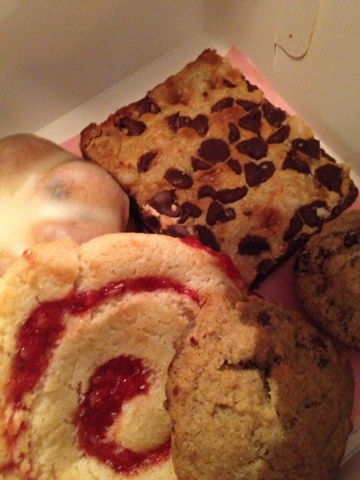 The pastries are all worth trying -I'm partial to the gingersnaps and raspberry pinwheel cookies. I also like the cakes as well as the muffins; the texture is moist and not dense like other versions of gluten free baked items tend to be. The best part about Pip's is that while it is gluten free, you probably won't notice the absence of the wheat flour. If you know someone that has Celiac's or if you might be going gluten free for other dietary reasons, you can go here and enjoy something good without any reservations. There's also a location on the UES - if you've ever been to Pip's, let me know. I'm interested to hear about your experiences, too. :) They say "We take ordinary and make it special." NYCFG agrees.